For many years, I thought I could take it or leave it. It wasn’t something I needed to discuss. But though this may be neither the time nor the place to talk about my struggles with those devilish white crystals, I understand that sometimes, it’s good to get things out in the open. So where to begin? With the cravings perhaps. Oh God, the cravings. Or with the midnight binges – in secret and unbeknown to my family. Or with the 3am drives to find a reliable vendor – a grey-green young fellow all shadow-eyed beneath a fluorescent strip-lit sky. Some of you will be shaking your heads already. ‘Has he no shame, no self-control?’ But others will know the demonic itch I describe, the infernal yearning that demands satisfaction even though it always remains out of reach. For although there are many health-shafting substances that can inflame our desires, few are the torments that compare to those of the salt addict in need of a bag of crisps. My name is Damon Fairclough and I am a slave to sodium chloride. It was with some trepidation, therefore, that I recently drove to the Lion Salt Works in Marston, Cheshire, to take a look at the only remaining open pan salt works in the UK. It is no longer in production – having opened in 1894, it closed in the mid-1980s and was in a state of gradual decay prior to reopening as a museum in June – but I couldn’t help feeling that even so, almost a century of salt making must have left its savoury mark on the landscape. So as I left the Runcorn Bridge behind me and headed in the direction of Northwich, I felt a little like a recovering 1970s coke-head who’d been despatched to write about Studio 54. While I had an undeniable interest in the subject I’d been sent to cover, I feared that once in there, I wouldn’t be able to resist licking the floor. First impressions, though, were a little surprising. I’d expected salt-encrusted buildings and an evocative industrial vista with an unmistakeable briny tang. 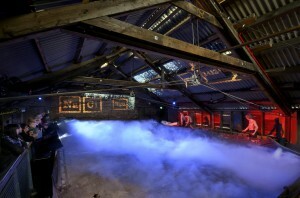 The Lion Salt Works, however, simply gleams with newness. 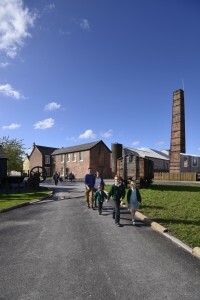 It cost £10 million to turn the site from a derelict relic into an immaculate showcase for Cheshire’s salt producing heritage and, having been open as a museum for under six months, it is as though the wrapping has only just come off. That 10 million quid looks like money very well spent. 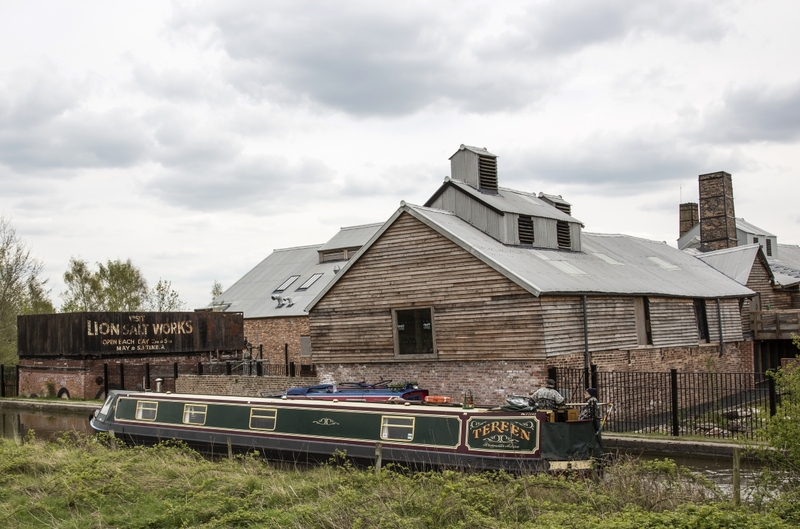 The site consists of a number of beautifully restored buildings including large warehouse-like structures, a pump house, some cottages, a fine chimney and a hulking beast of a brine tank. The brickwork is perfectly pointed, the woodwork is clearly prepared for the next 100 years. There are also set-square-sharp lawns, pristine pathways, a popular kids’ play area and even a butterfly house on site. Set in a landscape of winding waterways, open fields, quaint cottages and executive housing, the renovated salt works could initially be mistaken for an exclusive apartment development – an ex-industrial shell full of Poggenpohl kitchens and those bathroom lights that switch on by themselves. Fortunately, the investment into this museum hasn’t only been spent on its admittedly impressive appearance; spend a little time here and you soon realise that its historical story has been equally well thought through. The first revelation came as I stood on the edge of the site with Tom Whitehead, one of the Lion Salt Works’ expert guides. As we contemplated the adjacent Trent-Mersey canal – now an idyllic thoroughfare used largely by leisure vessels – he described how the landscape around us would once have been dense with industry and choked with smog. At its industrial peak there were 17 salt works within a four-mile stretch of the canal, along with many more throughout Cheshire, each belching out particularly sulphurous clouds of airborne filth from chimneys that were too short for the job. John Ruskin, the great Victorian art critic and social thinker, apparently referred to the area as a “smoking hellhole”, and it was with this essential contextual detail firmly front-of-mind that we then explored the rest of the site. 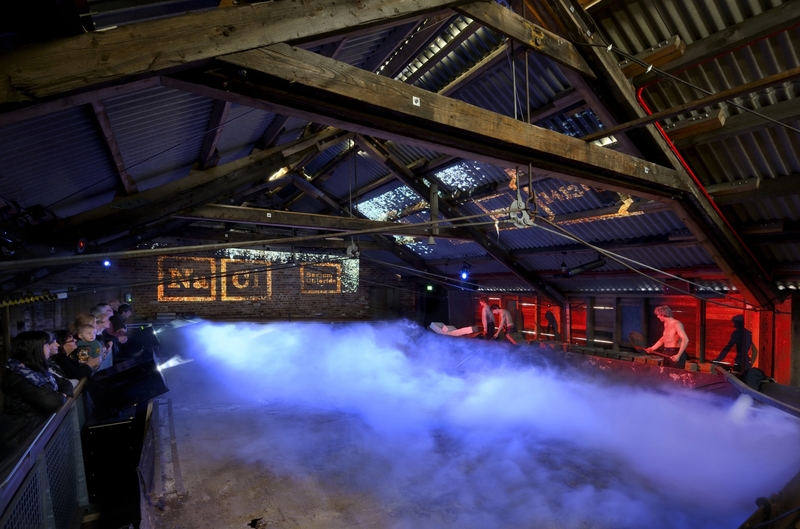 The Lion Salt Works – named after the Red Lion Hotel that originally stood on the site – was an open pan salt producer rather than a salt mine. This meant that instead of descending deep into the earth to chip away at the vast reserves of rock salt on which Cheshire sits, producers would sink a shaft into the ground in order to tap the rivers of brine that flow through the region below the surface. With a direct hit, the brine would jet into the air just like puncturing a can of tuna; it could then be pumped out and stored, before being boiled away in large iron pans to leave thick clumps of pristine white salt. This method of salt production has a history going back to the Iron Age. Originally, the brine would have been collected from natural springs; in Medieval times, producers received a tightly regulated allotment of brine from a well. It was only in the Victorian era, however, that innovations such as the Boulton and Watt steam engine made it possible to pump the salty elixir from deep in the ground, and Cheshire’s savoury fortune really began to be made. Between the Iron Age and Victoria’s reign, it’s hardly surprising that the size of the brine pans increased greatly, from the small ceramic originals to the iron giants of later years (the museum includes a number of exhibits that illustrate the method’s evolution, so it’s easy to compare). What seems astonishing, however, is that the core process – the heating of the brine, the exhausting raking and skimming of the salt crystals, then the drying, crushing and packing – remained largely unchanged right through until the works’ closure in 1986. In the era of hair gel and the ZX Spectrum, workers on this site were still bent double over boiling salt pans, raking the crystals in exactly the way it had been done hundreds of years earlier. It really was back-breaking work. We can easily imagine the torments and privations of coal mining or trawler fishing or steel production…but salt? That tasty powder that makes fish and chips so yummy? Surely it wasn’t so tough to boil up a big pan of water and collect the residue that was left? 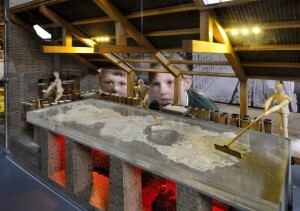 Well, if that’s what you think, a visit to the Lion Salt Works should most definitely be on your agenda. Via photographs, objects, videos and a wonderful dry-ice drenched open pan tableau, you begin to realise the extent of the physical slog involved in extracting that precious, life-enhancing compound. The men worked six days a week in shifts that were 12 hours long. They teetered along wooden ledges with boiling water on one side and a six foot drop on the other; they hurled iron-headed rakes into the murk and yanked them back over and over again; the constant billowing salt-steam stung at their eyes and stripped away their skin leaving cracks and sores that never really healed. Although the museum contains examples of the workers’ flannel clothing, the humidity and temperature were such that, in next to no time, every man working on the pans was stripped to the waist. In photograph after photograph, these muscular specimens glint and gleam like demi-gods. I haven’t seen so many sweaty blokes with their tops off since Tribal Gathering in 1995. According to Whitehead, the sexes would once have mingled together in the pan houses, with everyone stripped down to their undergarments. But in the eyes of Victorian moral guardians, this was a scene of debauchery straight from The Garden of Earthly Delights, and thus the 1867 extension to the Factory Act forbade women from working alongside the men. From that point on, women were confined to the packing room, well away from the gaze of all those sweat-licked, salt-flavoured Cheshire lads. The Lion Salt Works strikes a good balance between telling the fascinating tale of this specific site and the wider story of the product and its impact on the social and environmental history of the region. There are plenty of hands-on exhibits demonstrating physical processes and the principles of salt’s chemistry, along with displays explaining what the salt was used for and where it went once it left the county. Via the Trent-Mersey canal, the Lion Salt Works sent its output to Liverpool. From there, it was transported right across the world. Depending on how quickly the brine had been heated, the finished product would vary in texture – it would be ‘fine’ or ‘common’ in technical parlance – and might be destined for the chemical industry, for dairy production, for fishery use or as a preservative. In its most tempting form, as table salt, it would render virtually any dish more delicious than it would otherwise have been. 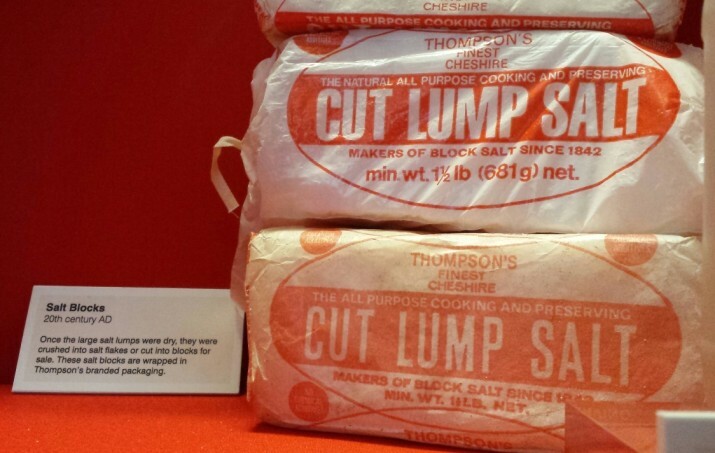 A particular speciality of the Lion works was ‘Lagos salt’ – a light and flaky variety that resisted high temperatures and humidity, and was therefore exported to West Africa in large quantities. By the 1950s, most of the site’s output was sent to Africa, and it was when that region stopped buying for a variety of reasons – including cheaper imports from Brazil and political instability – that the Lion Works’ viability finally went up in steam. As implied throughout this article, there is no cake, biscuit or other sweetmeat that is tastier to me than a bag of salt and vinegar chipsticks or similarly savoury snack (though the genetic manipulations of that errant cross-breed known as salted caramel just leave me confused). 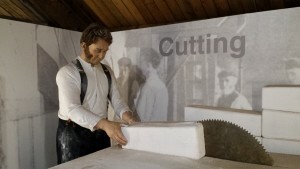 Nevertheless, I managed to reach the end of the Lion Salt Works tour without attempting to taste the furniture or otherwise embarrass myself and, as I enjoyed a coffee in the attractive new visitors’ centre (constructed within the old Stove House 5), I contemplated its new role as both an educational centre and leisure destination in one. It’s an excellent place in which to learn about Cheshire’s industrial heritage – previously unknown to me despite the region’s proximity to my Liverpool doorstep. But more than that, it is now an amenity that exists for its community, the very people whose sweat would once have soaked into its wooden walls. It has a beautiful new conference and events space (hopefully soon to be licensed for weddings) and a programme of regular events that make it well worth a regular trip. Just five months into its new life, it has already welcomed well over 10,000 visitors. Certainly, as a temple to one of my favourite flavourings, it served me splendidly on a wet Saturday morning in November, and I’d recommend it to anyone who prefers life with a savoury twist. And to folks of a sweet-toothed persuasion, I say go there; you might learn something. You people have type 2 diabetes to contend with, while we salt devotees must come to terms with our ever-increasing blood pressure, but by understanding each other’s lifestyles, perhaps we can help increase peace throughout the world. Of course, in my very wildest dreams, I dare to hope that one day there’ll be an enormous lottery-funded visitor experience called The Wonderful World of Crisps. Until that time comes, a few saline adventures at the Lion Salt Works will do me very well instead.